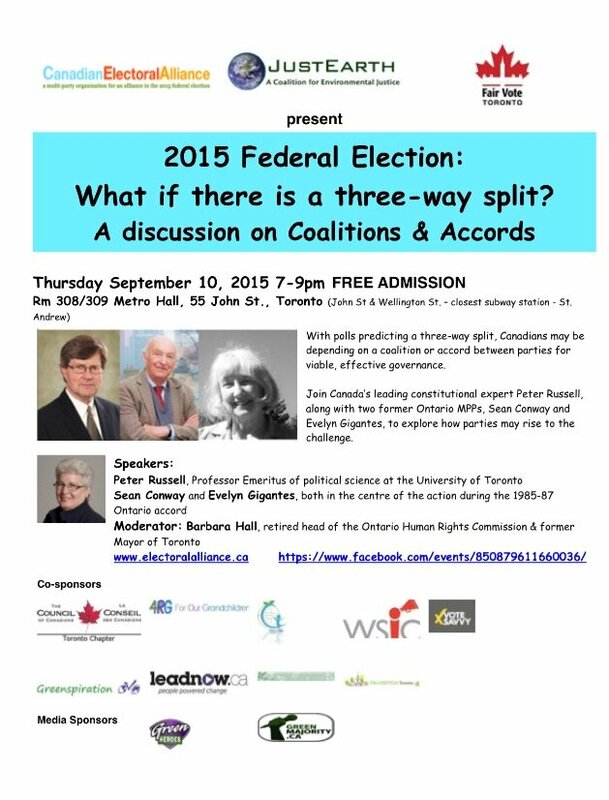 Canadian Electoral Alliance, JustEarth and Fair Vote Toronto are hosting an engaging and informative town hall on the nature of accords and coalitions in the Canadian political system and how they work. This year's federal election could be a crucial turning point for Canada. It is POSSIBLE that we will elect a minority government in October. This calls into question the possibility of cross-party collaboration, potentially among several parties. We are hosting this town hall as an opportunity to learn more about the historical and constitutional background of accords and coalitions; and to encourage discussion by, and support for, parties willing to consider shared-power options. Accords and coalitions are especially relevant to various organizations and sectors of society that want to see greater representation of issues that matter to Canadians such as climate change, electoral reform and many more. Peter Russell Russell is Professor Emeritus of political science at the University of Toronto and is one of the leading experts on Canadian constitutional politics. He is the author of Two Cheers for Minority Government: The Evolution of Canadian Parliamentary Democracy. Sean Conway Conway was the Liberal MPP for the Ottawa Valley from 1975 till his retirement in 2003. During the Peterson government of 1985‐1990, he served as the Minister of Education and Government House Leader. Immediately after the May 2nd provincial election in 1985, Conway was one of three Liberals who met to negotiate ‘ An Accord ‘ with the New Democrats, an understanding and an agreement between two political parties which brought about a change in government at Queen’s Park for the first time in 42 years. Conway is currently a public policy advisor at the Gowlings law firm and is a Visiting Fellow at Ryerson University. Evelyn Gigantes Gigantes was in local Ottawa-area public affairs broadcasting in the early 70s. She was MPP on three occasions between 1975 and 1995, and was a cabinet minister in the government of Bob Rae, first as Minister of Health, then Minister of Housing. She remains active as a volunteer for the NDP.